Seeking inpatient treatment for addiction is one of the most important decisions you’ll make for your recovery. But verbally expressing your feelings about the issues in your life that led you to substance abuse can be difficult. Psychologists understand that sometimes seeking an alternative form of communication can be helpful in the healing process and art therapy can help many work through their emotions in a healthy manner. Art therapy has been used in addiction treatment since the 1950s. By using the creative process, patients can express themselves in non-verbal ways. They can make incident drawings, which recreate an image of an instance that happened while they were using drugs or alcohol, as well as sculptures or even an art journal. 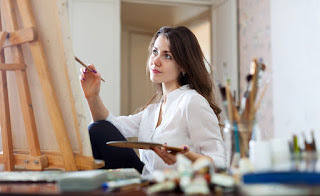 Painting during times of anxiety can be extremely helpful in relieving stress. Over the years, research has suggested that art therapy offers many benefits, including helping patients work through feelings of denial and shame, as well as reducing their resistance to addiction treatment, all while giving them a healthy outlet for communication. Sometimes art therapy can motivate patients to take an active role in their recovery. Art therapy has been shown to be helpful when treating women who have addiction, and with adolescents as it is theorized that women’s social roles and psychosocial needs often respond well to less traditional treatment options. It may help with depression and reduce feelings of anger and stress. Creating art also reduces stress hormones according to research. After as little as 45 minutes of making art, cortisol levels can lower significantly. Using art therapy often works well within 12-step programs. Just like art comes in many forms, art therapy can go beyond drawing and painting for patients who express themselves better in other mediums. Music is often part of these programs, as is creative writing, journaling, creating collages, dramatic role play and even sometimes basic construction or woodworking projects. You can try different forms until you find the one that suits you best. Creating and completing a work of art – whether it is a sculpture, portrait or short story – can give a patient a sense of accomplishment and this boost of confidence can sometimes ignite the initiative to move forward in the healing process. So don’t worry if you aren’t Pablo Picasso and can barely draw a straight line – the act of creating and expressing yourself can help soothe your anxiety and lift your mood, allowing you to open up and release some of the tension that holds you back. Rising Roads Recovery offers art therapy as one aspect of its treatment program for addiction. We understand that art has the potential to be a powerful tool to use for emotional growth and we encourage our patients to use it to express themselves. Please inquire at 1-866-746-1558 to start your recovery today.